T-Mobile G1 hits the UK | Android Blast! The UK is no longer waiting for the T-Mobile G1. The Android phone has finally hit the shores of the UK. 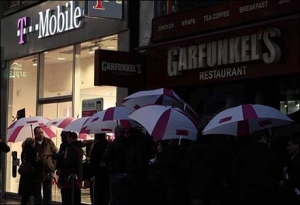 Users started lining up at 7am at the T-Mobile Oxford Street store in London. "According to a T-Mobile spokesperson, the first queues began to form at 5am outside their flagship London store. It has also been reported that more than 25,000 people had registered their interest online following the US release last week."